Benjamin Franklin Goodrich (BF Goodrich for short) was more than a tire salesman. He was the Indiana Jones of the entire tire industry. 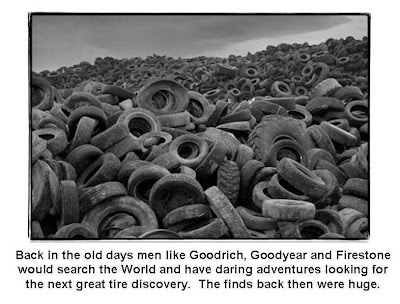 Men like BF, Wassa Goodyear and Fred Firestone scoured the Earth in search of tires. 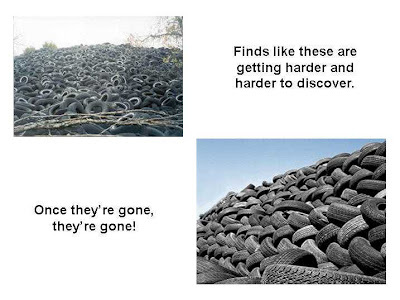 Most people don’t realize that tires are one of our most treasured natural resources. There are sadly very few tire deposits left in the world. One day soon the automobile industry will come to its knees if we don’t continue to use this commodity resourcefully. Once it was exciting and easy for our tire pioneers to bring us great tire products. Sure, they had exciting discoveries and lots of frequent flyer miles. 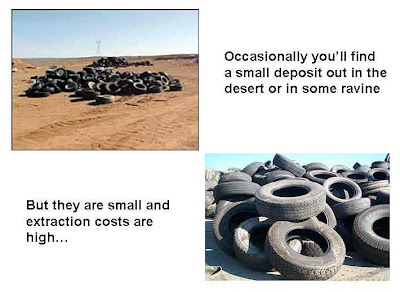 But lately, the frequent flyer miles aren’t worth as much and the tire discoveries are drying up. 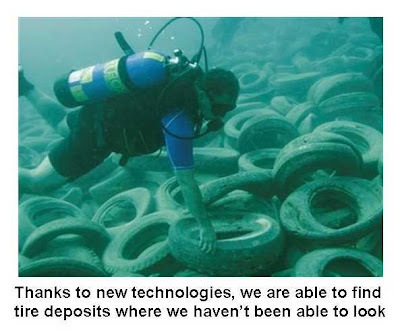 Sure, new technologies have yielded new discoveries. There has been a lot of progress under the ocean and word of secret frozen ice sheet deposits have been circulating for years but even those will be limited discoveries. Once they're gone, they're gone. Inspired! Hearts were very sad during the great Tire Fire of 1983. All those lost souls. kurt - Today's post was very Kurt-like, wasn't it? Just reading this makes me tired. carlae - Just think how tired I got writing it!!! This post is entirely ridiculous. Make sure you don't upset Carlae. You don't want to rubber the wrong way! You know, even though cars and car engines have gone through tons of modifications and improvements, the tire really hasn't changed much over the years. Surely those resources can bounce back! jeff - The two of you seem to be out of balance! leelee - I am tirelessly working on it! Thanks for your kind comment on my blog. I too will be back - from a fellow Oregonian!! This is depressing. Seriously. Seeing the tires in the water made me angry. I recall studying about the great Rubber Rush of the 1800's; thousands of people headed west to seek their fortune. Many fell flat and never bounced back. Why? Why didn't you tell us this years ago?? You know, before I went around burning the tire collections in trailer parks?? 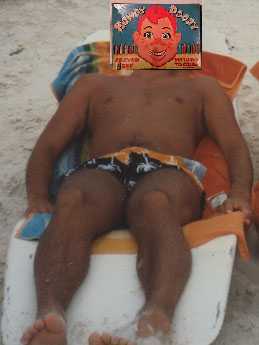 I could have been a nickelaire! Inform greenpeace something needs to be done. "wheel of fire!" I wish I had a mountain of black tires outside my window! What richness, what delight! Telethon? Perhaps we should divert some of that money wasted on AIDS research and saving stoopid whales to ensure that each and every child has a tyre of their own? rick - Perfect. There's already a couple of other Oregionians that have made it here too. chris - Look it up on google...I think its some sort of destination for snorkelers and divers. I have no idea why. sj - They're good for swings though! heyjoe - I see you are quite learned in the ways of the rubber! bee - Ha! You tire burner! It was like burning a big pile on money (only smellier). 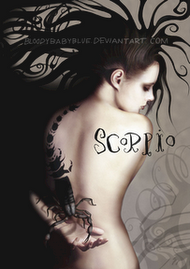 anette - I know. It's a coveted view for sure. kelley - Good idea. A telethon. I'm gonna dye my hair jet black like Jerry Lewis such for the occasion! arizona - See...those farmers knew they'd be rich eventually! Just think of the residual effects of a tire shortage; no more ugly black rubber welcome mats to clean your shoes on! The horror! I remember hunting for snow tires in the winter. The white walls were well camouflaged, but we'd try to spot the studs that would lead us to their winter breeding grounds. During the summer we'd hunt for cheater slicks with baby moons. That was easier because you could hear 'em squeal when they peeled out. maureen - What will we do? I would miss all the rubber marks on the dividers on the freeway or down the street. That last thing looks like an inverted chip and dip container.